Our first official Urban Sketchers Montreal Sunday Sketching! Nine artist met at Jean Talon Market for a morning of drawing in freezing wind. Just the kind of cheery reception we planned for our first outing. Well, not really, but I guess you have to be an optimist to do outdoor sketching this late in the year. Some of the the others (Shari for one) love markets. The colors and complexity, the tasty looking foodstuffs. I guess I’m the odd man out in that respect. I wasn’t sure pumpkins and squashes would be my thing. The first thing I saw on arriving was a violinist busking for change. Perfect! I’ll spend the morning doing tiny little watercolor portraits in a 3″ sketchbook. Might as well take advantage of all the merchants in their market stalls. Captive subjects! When sketching people in the field, you need to find those captive subjects – people who aren’t going to up and leave on you. 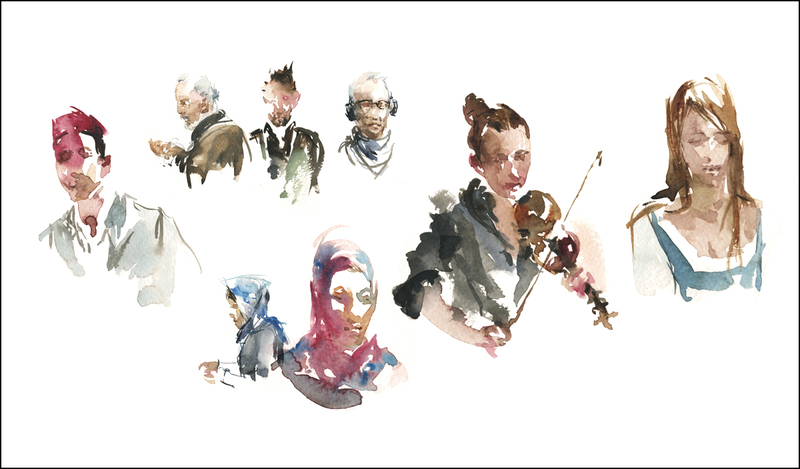 I’m usually a fan of making a good drawing before painting – but these were moving subjects, done quickly, and from within a dense crowd screening the view. So, I figured it would be a lot more entertaining to go straight in with watercolor. We were all amazed at what you can do with a brush and nary a pencil line. Amazing sketches. Love these. Cannot wait to get to Montreal in a few weeks myself. Love these little gems! Más! Más! Interesting colour for your shadows. The violinist is lovely. Such a light touch.